Udaipur:A book of small satirical essays "Shh…Shh…ChupVikas Ho RahaHai" was released in the inaugural function of the 27th Foundation Day of the fortnightly News paperMahavirSamataSandesh on 17th June, 2018. 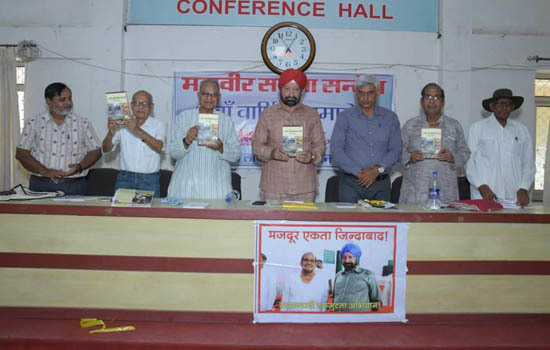 The All India General Secretary of Hind MazdoorSabha Comrade Harbhajan Singh Siddhu, Member of the state committee of CPI(ML) Comrade ShankerLalChaudhary, Socialist thinker and writer PannaLalSurana, Prof. NareshBhargava were among the guests who released the book. The book has been authored by Dr. HemendraChandalia, Professor of English at JanardanRai Nagar Rajasthan Vidyapeeth( Deemed University) and editor, MahaveerSamataSandesh. The book has a collection of topical satirical pieces on the contemporary social and political situation. It is a collection of the satires written in the last three years. Prof. NareshBhargava said that this work is both entertaining as well as educating. The style and language are such that everybody can enjoy reading it.